THEY may keep the lolly jar stocked up and spoil the kids rotten, but Grandma and Grandpa aren't as rich as you might think. A recent survey of 5000 retirees had revealed that almost a third of Australians over the age of 80 had exhausted their retirement savings. 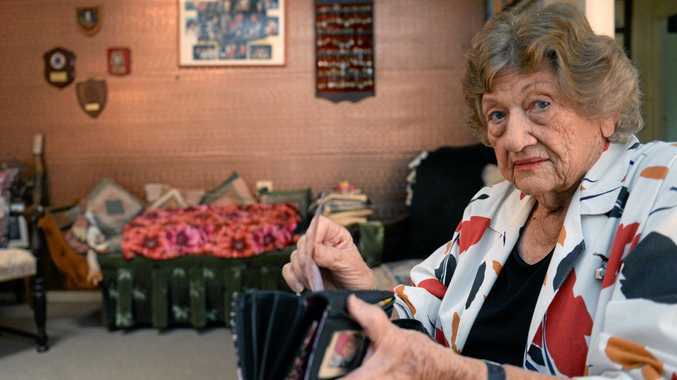 Bundy pensioner Nina Higgins said it was tough to have enough money saved for retirement due to superannuation being created too late in her career. "We estimated that your life expectancy wouldn't be much more than 85, well I'm 86 now,” she said. And she doesn't plan on slowing down yet, continuing to be an active part of the Bundaberg community through her involvement with volunteer-run events such as the upcoming Seniors Expo at the PCYC. Mrs Higgins said she still completed similar tasks to when she had first retired such as driving and had not suffered from many costly health issues, but knew other seniors in the area were not as fortunate. "It's not cheap for them, even if they do go to the public health system,” she said. Living on the pension means Mrs Higgins is still in her own home which will one day become the inheritance for her children. The survey revealed that many seniors are no longer motivated by the desire to leave an inheritance but focus more on spending cautiously to ensure they are secure in their later years. National Seniors Australia's interim CEO Professor John McCallum said that Australia was amongst the longest life expectancy rates with women expected to live 87.3 years and men 84.6 years. "The problem is despite many older people being aware of increased longevity, later life - and particularly nursing homes - is viewed very negatively,” he said. Prof. McCallum said that residential aged care has created a fear factor around old age and preparing for that point in life. "As a society, we've also over-emphasised the risk of dementia so that every memory lapse is seen as a symptom,” he said. The survey revealed that despite massive financial concerns, over half of the participants had altered their financial plan for a longer life expectancy. It also revealed that many older Australians are wary of another Global Financial Crisis and generally need assistance in financial planning for old age. Prof. McCallum believes there is serious opportunity for the superannuation industry to step up and look after our senior community. "I've got a philosophy; Get up, get dressed and get out. The house is only meant to sleep in,” Mrs Higgins said. The Bureau of Statistics said that people over the age of 65 made up more than 23 per cent of Bundaberg's population in 2016 and 17 per cent nation-wide. National statistics show that Australia's elderly population is set to increase over the years with an estimated figure of 8.7 million older Australians by 2056, and 12.8 million by 2096. The amount of older Australian's in the labour force has doubled from 6 per cent in 2000 to 13 per cent in 2015, with less seniors willing to retire in their current financial situation.